Archaeologists and authorities scoffed when a local newspaper published an article claiming to have discovered mysterious step-pyramids on the island of Tenerife. 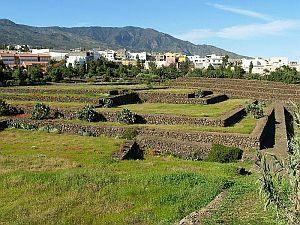 Just more agricultural stone terraces they said, such as are common throughout the Canaries. But Norwegian ethnographer Thor Heyerdahl thought differently. Dr. Heyerdahl, who had extensive research on the pyramids of Túcume in Peru, was intrigued by photos of the site and on visiting the valley of Güímar to see for himself, he believed these were neither terraces nor random piles of stone cleared by the Spaniards, as some had tried to explain them away. They were painstakingly built step-pyramids, constructed according to similar principles as those of Mexico, Peru and ancient Mesopotamia. The Ethnographic Park Pirámides de Güímar offers you the possibility to visit these rare and interesting structures, and will provide you with theories regarding the possible diffusion of ancient civilisations. Besides the six step pyramids, the ethnographic park is also home to the museo Casa Chacona(museum of Casa Chacona), where a life-size replica of Dr. Heyerdahls' boat, indigenous masks and ceramic figures are on display. There is also an auditorium/cinema, cafeteria and an ecological souvenir shop. So, if you like history, why not check out these mysterious wonders right here on the eastern shore of Tenerife. The Pyramids at Guimar, famous in Tenerife, are a popular attraction on the island. Unlike most of the other pyramids dotted all over the world, however, they are not particularly ancient. They have been dated to as recent as the 19th century. You thought that this collection of step pyramids was of quite ancient origins, like the Egyptian pyramids at Giza, several millennia old. There is actually much controversy surrounding the actual date of the construction of these artefacts. In 1990, an article appeared in the Tenerife newspaper, "Diario de Avisos", all about "real pyramids in the Canaries". It was read by the explorer Thor Hayerdahl, a man who had much interest in how ancient civilizations possibly connected with each other. His famous "Kon Tiki" expedition was launched in pursuit of such things. 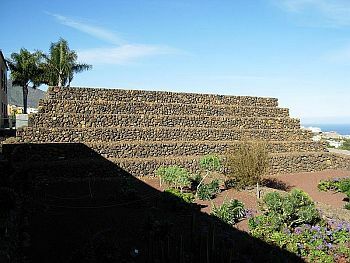 As Heyerdahl had long postulated a link between the Egyptian pyramids and those of the Maya civilization in Central America, the story on the Pyramids at Guimar piqued his interest and he relocated to this area in north-east Tenerife. He established a permanent residence at the pyramid site in 1994 and remained there until his death in 2002. This is where the controversy comes in. Heyerdahl maintained that the pyramids were of ancient origin. Between 1991 and 1998, excavations were made and analysed. The pyramids were in three distinct layers. The earliest layer contained shards of pottery that were estimated as being from the 19th century. In the site's exhibition, it is worth noting that no mention is made of the conclusion of the excavation and the concept of a connection with the Guanches is suggested. Apparently, these pyramidal structures were once liberally dotted around the whole island of Tenerife, but, over the decades, were systematically dismantled to use as cheap building materials. The Guimar pyramid site originally contained nine structures, but now, only six remain. Housed in a restored, traditional Canarian building, the museum presents exhibitions of, amongst other things, step pyramids from around the world and the method of construction involved in the Guimar ones. Built partially underground, this feature shows a fifteen minute film every hour, all about the pyramid site and featuring information on Thor Heyerdahl and his many varied expeditions. Commentary available in six languages. Containing a cafe, souvenir shop and information centre. An exhibition concerned with ancient navigation, including a life-sized replica of Thor Heyerdahl's famous reed boat, Ra II.